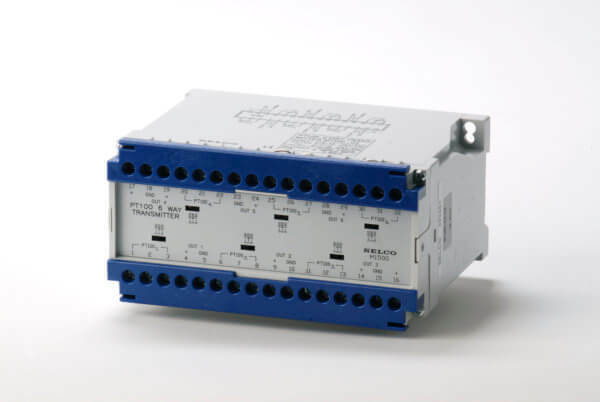 M1500 contains six signal transmitters 4-20mA for two- or three wire PT100 temperature sensors integrated in one box for DIN rail mount. The outputs can be fed into e.g. analogue alarm monitors as the SELCO M3000. The SELCO M1500 PT100 6 Way Transmitter includes six current transducers in one box for use with DIN60751 3-wire PT100 temperature sensors. The output signals from the M1500 are 4-20 mA current signals, which can be easily fed into e.g. an analogue alarm monitor such as the M3000 Analogue Alarm Monitor. Each sensor input of the M1500 can be configured for three different temperature ranges: 0-160 ºC, 0-300 ºC or 0-600 ºC.